(Office of Her Majesty- Press Department- Dead Sea) Speaking at the World Economic Forum (WEF) Dead Sea session titled "A New Vision for Arab Employment", Her Majesty Queen Rania Al Abdullah called today for a regional renaissance which can be achieved through more innovation, openness, flexibility, and new partnerships in order to achieve that vision. 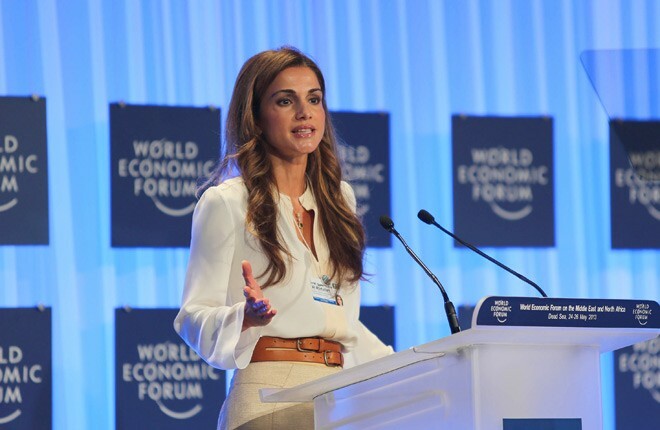 In the plenary session which focused on creating ways to deliver decent and productive jobs in a timely and sustainable manner in the region, Queen Rania, the only Arab member on the WEF foundation board, highlighted education as one of the main reasons why the Arab world lags behind when it comes to the issue of employment. "Isn’t it ironic that throughout the various seasons of Arab unrest, the debate on education has received so little air time? It seems to have slipped from our regional consciousness and our national priorities," Queen Rania said in her speech. The plenary session is one of many other sessions at the World Economic Forum on the Middle East and Africa held at the King Hussein Bin Talal Convention Centre - Dead Sea from May 24-26. The session discussed issues such as scaling social innovation, unlocking institutional drivers, and assessing the impact of global employment trends. In her address, Her Majesty noted that "when it comes to the topic of employment in the Arab world, we’ve been saying the same things, pointing out the same facts, quoting the same reports, and drawing the same conclusions for years and years," adding that piecemeal approaches and incremental change are luxuries that are not available to us anymore. "The reasons differ … but the answer is the same: there can be no excuses anymore," Queen Rania told the audience. "We must do better. Our children deserve it. Our young people demand it. And our region depends on it." “’A new vision for Arab employment’ requires a regional renaissance,” she added. Queen Rania said that this renaissance can start with forging closer ties between governments and the private sector, and finding synergies between ministers of education, labor, and finance with CEOs and employers to create tangible relationships between schools, skills and the marketplace. "In an ideal world" Her Majesty went on to say, "schools would feed employers with bright and hungry young minds, while employers would partner with schools to inspire entrepreneurship and innovation from which they would, ultimately, profit." Queen Rania pointed out that the majority of private sector employers are dissatisfied with graduates’ skills, and on the other hand, the majority of graduates are dissatisfied with the skills they’ve got. "Preparing our children to be ‘college ready’ with a handful of exam results, could limit them," Her Majesty said, adding that "preparing them to be ‘innovation ready’, on the other hand, with exam results, soft-skills, and transferable experiences opens up endless possibilities for personal and professional success. That’s the key to remaining relevant and employable in a fast-paced, competitive world." Quoting from a book by education specialist Tony Wagner from Harvard University, Her Majesty added that "because knowledge is so readily available nowadays on the internet, what you know matters less than what you can do with what you know." Concluding Her remarks, Queen Rania painted a picture of the sought-for Arab World "where entrepreneurs teach and our teachers innovate, where students learn in the playground, and dream in the classroom … Where our young people start-up companies, fail, get inspired by their failure, and create bigger and better ones … Where the next big thing was developed by the kid next door … Where there is a revolution every day in streets and squares across the Arab world…a revolution of ideas and innovations." Moderated by John K. Defterios, the session included panelists Majid Jafar, Chief Executive Officer, Crescent Petroleum, United Arab Emirates, a member of the Global Agenda Council on Youth Unemployment; Ellen Kullman, Chair of the Board and Chief Executive Officer, DuPont, USA; Mohammed H. Al Mady, Vice-Chairman and Chief Executive Officer, Saudi Basic Industries Corporation (SABIC), Saudi Arabia, a Co-Chair of WEF on the Middle East and North Africa, and Tarik M. Yousef, Chief Executive Officer, Silatech, Qatar; a member of the Global Agenda Council on the Arab World.